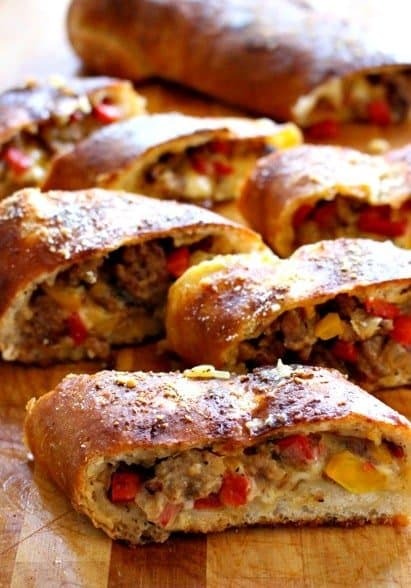 This Sausage and Pepper Stuffed Bread is the answer to getting a sausage roll done right. Make it ahead, freeze it then bake right before you need it! Let’s talk about stuffed bread for a second. Sausage Rolls, Stromboli, Calzones. Whatever you want to call bread with some sort of filling inside. Here’s what I can’t stand – when you order your sausage roll, or your Stromboli, and it comes with the smallest amount of filling and all bread. Or on the other hand, you get your stuffed bread and it’s ALL cheese. Just a bunch of cheese oozing out of the bread. Not good. What I’m talking about here is ratios. You need to have the right ratio of ingredients for a stuffed bread. So in my constant disappointment of ordering stuffed bread of any kind out at restaurants, I decided to do it right and make my own. I’m love sausage and peppers so I went with that combination of ingredients for this recipe. 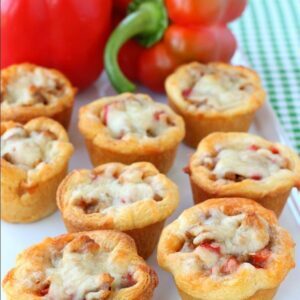 You can switch up the filling ingredients to whatever you like, chicken, ground beef, mushrooms, different cheeses, etc. To keep it easy, I used a store-bought italian bread dough. 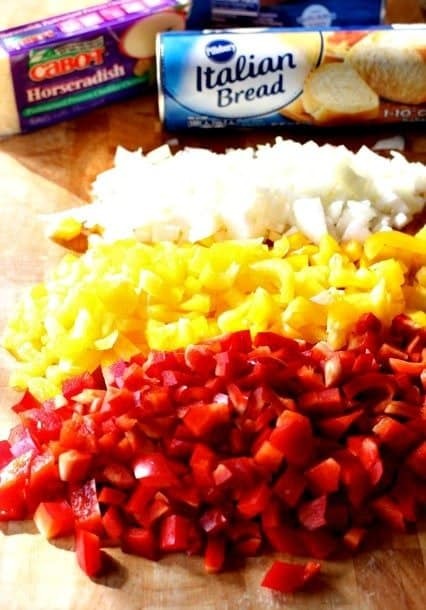 Then I chopped up a couple of peppers and onions and got out my cheeses…but the secret ingredient in this stuffed bread is the Cabot® Horseradish Cheddar Cheese. Cabot was nice enough to send me a package a while back and I’ve been trying to think of the right way to use this cheese besides just cutting it up and eating it. I have to say, I was totally surprised when I tasted this – I knew it would be good, but it was way better than I had expected. 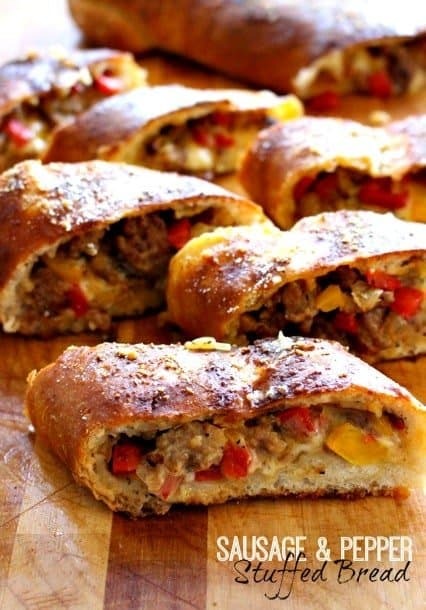 It worked out perfect in this sausage and pepper stuffed bread! Start by cooking the onions and peppers together with a pound of Italian sausage in a large skillet for about 15 minutes. Divide the filling in half and let cool. 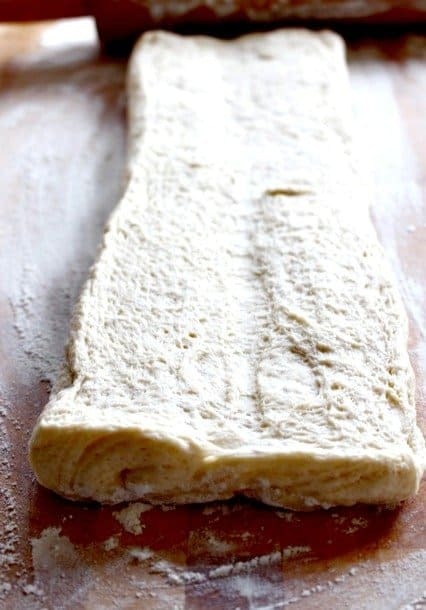 Open one of the dough packages and set the loaf on a floured cutting board. What you want to do is cut a line right down the center but not all the way through so that you can open it into a rectangle like this. Next you’re going to roll out the dough into a 15″x7″ rectangle, approximately, don’t worry too much about the size. 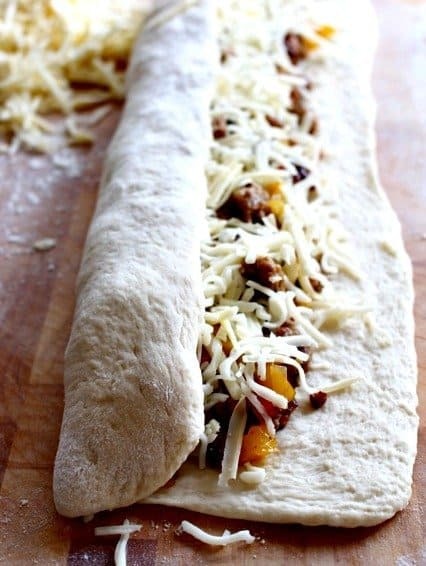 Once you’re filling is cooled, take half the filling and lay it down the center of your rolled out dough. Then fold over each half of the dough to seal the bread, using an egg wash to help it stick together. Here’s where you’ll put the egg wash, then fold over the other side of the dough to close the bread up. Repeat with the other loaf and place on a baking sheet, seam side down in a 400 degree oven for 15-18 minutes. Once they cool for a few minutes, slice carefully and serve with marinara sauce for dipping. Perfect stuffed bread…the Mantitlement way. 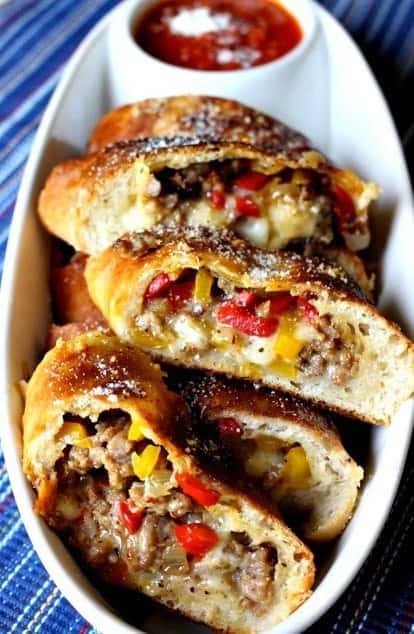 sausage and peppers with a creamy cheese stuffed in a parmesan coated bread. Open the package of dough and place the loaf on a floured board. Make a cut down the center of the loaf to butterfly the loaf open. You won’t cut all the way through, just cut enough to spread the loaf in half. Holy Batman, does that look delicious!! 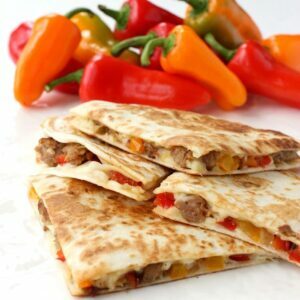 Sausage and bell peppers are usually my go-to pizza topping, but this is really an endless possibilities dish. I may have to do this up to take to my next potluck. People will think I am really very awesome. I will let them ramble a bit and then give you some credit 🙂 I’m also thinking this would be a fun one with the kiddos and a spread of many toppings to choose from and assemble to one’s liking. How hot is that horsey cheese? The cheese isn’t hot at ALL. 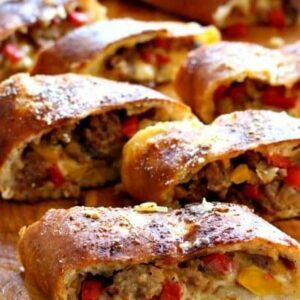 Just a perfect flavor for this sausage bread, my 5 year old ate it…:) Yes, I’m thinking a topping party would be awesome! Thanks for commenting, I hope your try it! I’ve made this numerous times now. It’s always a hit. I couldn’t find the Cabot cheese, but what I did find at my local supermarket was a wonderful horseradish/bacon cheese. On top of everything else, on the very top of the filling before I close it, I actually layer slices of Provolone. It makes it extra cheesy and delicious! Another random aside– I use the Pillsbury Crescent Rolls and just roll out the dough and moosh it together at the seams. Again, my local grocery doesn’t sell the Italian Bread Dough or even anything similar. It still turns out great, though! Can you freeze this or make ahead? You can definitely make ahead and freeze it! Just add about 15 minutes to the cook time if you bake it frozen. If you precook before freezing does the bread become soggy when your ready to cook up? Or, do you suggest freezing after you prep (dough uncooked)? Definitely cook first, then freeze. Put the frozen bread right into the oven, don’t thaw first and it shouldn’t be soggy at all! Monica, yes I would cover it with foil and reheat at 350 for about 15 minutes. If center isn’t warmed through just give it a few more! I’m glad you enjoy it! My local grocery store doesn’t carry the Pillsbury Italian bread so I bought Pillsbury crescent sheets. I’m hoping they hold up and work well for this recipe. I’m excited to try this. It should be fine, just press the seams together first. Good luck! Just made this! It turned out amazing and family loved it, thanks for sharing the recipe. Your welcome, I’m so glad you liked it! Do you have a recipe for the bread roll? I know the store bought is faster but I really like home made. I don’t, sorry Helen! I’m sure you could search a recipe for homemade though.